I have been thinking of doing a Teach Me Tuesday on Japan for a long time and now, with Japan in the news, I am a little tongue-tied. My mother’s side of the family is from Hiroshima and though we have a cousin who now lives in Tokyo, all are safe and sound. So this post is for everyone who has ties to Japan, either though family or emotionally (and that is probably most of the world as we look on with empathy and try to help). The books I’ve chosen reflect a version of my own family history. Yoko’s Paper Cranes by Rosemary Wells is lushly illustrated with nods to Hiroshige’s iconic block prints called ukiyo-e. Allen Say is another favorite author of mine and his chapter book reflects his personal story of a young aristocratic boy who is determined to learn cartooning from a famous artist in The Inn-Keeper’s Apprentice. Both books traverse between two worlds, which I think, reflects the simultaneous push-pulls of the history of Japan with respect to the United States. In the case of Yoko’s Paper Cranes, the two worlds are the distance between the United States and Japan. In The Inn-Keeper’s Apprentice, there is also the two different worlds of pre and post war Japan. My own family history is a microcosm of the history of Japan which I studied a bit in college — Chinese history, my other heritage, being so much older was a more daunting academic challenge. My mother thought it important to make sure that we knew that our family was from the Daimyo class, who were feudal lords of vast holdings of inherited land. My mother said that we were distantly related to the emperor but not through blood but marriage. Only the emperor used the chrysanthemum as the royal crest but if your family was related through blood, their family crest (called Ka-Mon) would include the chrysanthemum. Samurai, which is a term more widely known, were the military nobility loyal to a particular Daimyo family. I learned from a museum in Japan that there were something like 22 ranks of Samurai, determined by birth. It was possible to become a samurai much like a stable boy in England could be knighted. In the case of Japan, even an exceptional stable boy could make the lowest rank of samurai. Throughout much of Japan’s history, there were power struggle between the emperor and the daimyo ruling class. When the daimyo class were powerful and united, the leader ruled the country as Shogun (which is more well-known term thanks to James Clavell). To keep the daimyo in check, the emperor required each family to send a contingent to the court as ladies-in-waiting that served to forge ties and as hostages. When Admiral Perry showed up in 1853, he forced Japan to open the country and this is considered the trigger that caused the downfall of the Edo Shogunate. The Meiji Restoration that followed put the emperor back into power and the ruling class was stripped of their land. This part of history is now personal. My great uncles and great grand parents fortunes were land based so with their lands gone, had no means of income. Worse, part of their lost lands contained sacred burial grounds of ancestors and needed to be purchased back. My male relatives immigrated to Hawaii to work the sugar cane and pineapple plantations — something that was meant to be temporarily that turned into forever — in order to earn the money. When my great-uncle married in Hawaii, he was disowned for not marrying within his rank. That seems so silly now but that was the way it was back then. My grandparents immigrated to San Francisco and without knowing English, worked as house servants and also ran a boarding house. Such is the immigrant experience. Other daimyo fared better. The most famous daimyo descendants today in Japan include Morihito Hosokawa, the 71st Prime Minister, and figure skater Nobuari Oda. The Japanese American story would not be complete without remembering their forced internment during WWII and after that bad experience, the was much effort made to assimilate; much more so, in my opinion, that any other Asian ethnic group here in America. My mother and her family were forced to most of their belongings behind to move to a remote part of Utah where the nukes were tested underground. Their samurai swords were left hidden in their boarding house, hidden between the studs of a wall but never to be retrieved again. In a final weird twist of fate, my brother married my lovely sister-in-law who is also Japanese American and her sister-in-law is from Hiroshima also. It turns out that she was from a samurai that served my family as we all have the same family crest. They had made baseball caps with the crest and when our cousin from Japan sent us a copy of our family crest, it was virtually identical (see above, ours is the second one to the right on the first row). It is, indeed, a small world! Both images from The Book of the Samurai: The Warrior Class of Japan by Stephen R. Turnbull, page 82.
p.s. The family crest follows the mother’s side of the family. I thought that was interesting as it indicates a more matriarchal society though I am not sure if this is actually true. Yoko communicates with her grandparents back in Japan by sending them origami cranes as a reminder that she, too, will return to visit just like the cranes in their garden. A young boy from an aristocratic family follows his own destiny by apprenticing with a famous cartoonist. This is Allen Say’s own story set in post war Japan. This is a fast paced, samurai sword wielding adventure series set in medieval Japan. Moonshadow is a ninja samurai on a dangerous spying mission who success will prevent a civil war from breaking out. Both Shogunate Japan and sword fighting come alive. Author Simon Higgins is a martial arts swordsman expert so he really knows his stuff. I had this book in my bookshelves and just uncovered it. It’s another great story that makes 16th century Japan come alive! If you want an enjoyable beach read set amid the turmoil of Shogunate Japan, this is a classic! I love this iconic block prints called ukiyo-e. My mother bought some a long time ago when she visited Japan and now they are collectible but dependent on condition. There was a time when merchants would use imperfect prints as newsprint and wrap goods with them. If you read Yoko’s Paper Cranes, you’ll notice Rosemary Well’s references to these prints in her gorgeous illustrations. 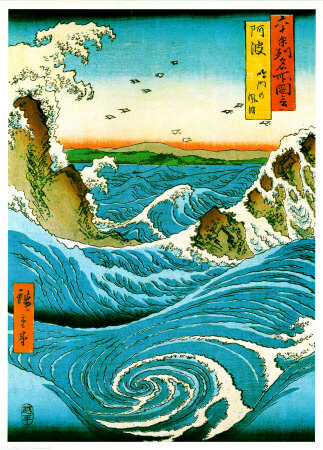 To me, Hiroshige is the most famous Japanese ukiyo-e artist, but he was also influenced by his contemporary, Hokusai, whose works are below. I think Hokusai is a little too old-fashioned for me. What do you think? These days the Japanese family crests are used by graphic designers to portray an “Asian” or “Japanese” motifs. They are beautiful examples of branding though, don’t you think? I don’t know who the cartoonist was in The Inn-Keeper’s Apprentice, but it could have been Osamu Tezuka who was a Japanese Cartoonist, manga artist, animator, producer andmedical doctor, although he never practiced medicine. Born in Osaka Prefecture, he is best known as the creator of Astro Boy, Kimba the White Lionand Black Jack. He is often credited as the “Godfather of Anime“, and is often considered the Japanese equivalent to Walt Disney, who served as a major inspiration during his formative years. His prolific output, pioneering techniques, and innovative redefinitions of genres earned him such titles as “the father of manga“, “the god of comics” and “kamisama of manga”. I’m so glad you left a commetn over on PaperTigers as I missed this wonderful post last month. So interesting, and my heart goes out to your family for their experiences during the Second World War. Thank you so much for your comment and for solving the mystery of the cartoonist Allen Say apprenticed with. And thank you for sharing the link to your post!! I do think that everyone’s immigrant story is so interesting. My mom just wanted us to remember our heritage. She’s very proud of being from a daimyo family but when all’s said and done, my mom is a pretty cheerful person without regrets. I don’t think she’s bitter about her WWII experiences.